Intrinsically disordered proteins (IDPs) possess regions of primary sequence that are highly flexible in solution and that lack a well-defined three dimensional structure. In some cases, entire proteins are disordered. A disorder continuum extends from fully structured, to molten globular, pre-molten globular, and random coil states. Over the past decade, bioinformatics has convincingly shown that IDPs are ubiquitous in higher organisms. IDPs are essential in many cellular functions and play critical roles in many disease processes, thus demanding a fundamental understanding of how IDPs function at the atomic scale. It has long been recognized that for a protein, the cellular environment is much different than the environment of the test tube. In the cytosol of E. coli, for example, the concentration of proteins is approximately 300 g L–1. Our understanding of the biophysics of disordered proteins is based almost entirely on how IPDs behave under pristine in vitro conditions. We know relatively little about how the highly crowded conditions found inside cells will influence the conformational and dynamic behavior of IDPs. Our lab is attempting to address this fundamentally important question about the effects of macromolecular crowding on IDP structure and dynamics. 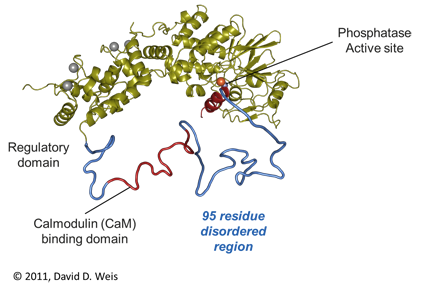 Calcineurin is a phosphatase that plays essential roles in development and in the immune response. In particular, it is the target of several immunosuppressive drugs used in organ transplant patients. Calcineurin activity is controlled by calcium signaling mediated by the protein calmodulin. When calmodulin is activated by Ca2+, calmodulin binds to the intrinsically disordered regulatory domain of calcineurin. We have found that this results in the formation of an extended alpha helical region in the regulatory domain. [Publication link] Currently, we are attempting to understand the mechanism by which this extended helix formation leads to activation of calcineurin.